Alciato at Glasgow: Emblem: In garrulum & gulosum. Instar habet nasi, multiforisque tubae. Signabit, volucer cùm Truo pictus erit. It screams with a harsh cry, it has an enormous throat, a beak like a spout or a many-holed trumpet. 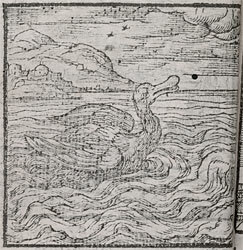 The pelican bird, when painted, will indicate an ugly ranter, enslaved to lust and belly.